Routine Maintenance DIYs For all of your routine maintenance needs. 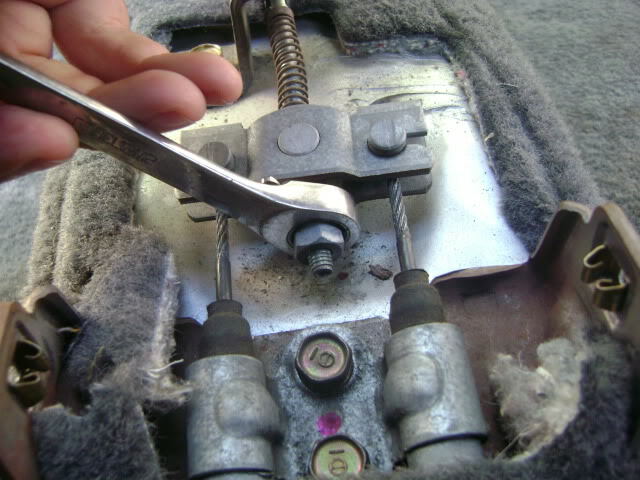 Tighten "loose" rear emergency brake cables which no longer prevent the car from rolling on a hill when parked (thus having the weight held by the trans. ), or are not capable of stopping the in case of an emergency. Use jackstands. Do not over tighten as this will force the rear brakes onto the rotors/drums while the E-brake is down, thus wearing your brakes down alot faster. Step 1 - Raise up the rear end of the car. Ummmmm... hopefully self-explanatory, just make sure both rear wheels are off the ground. Remove shift ****. 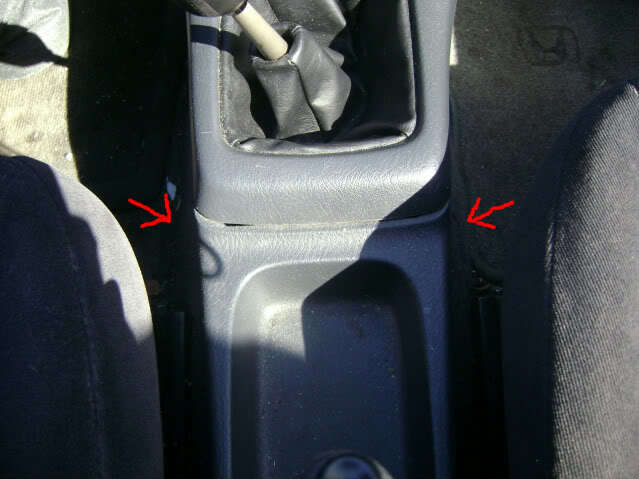 Take out the two screws (one on each side) that are closest to the shift boot. 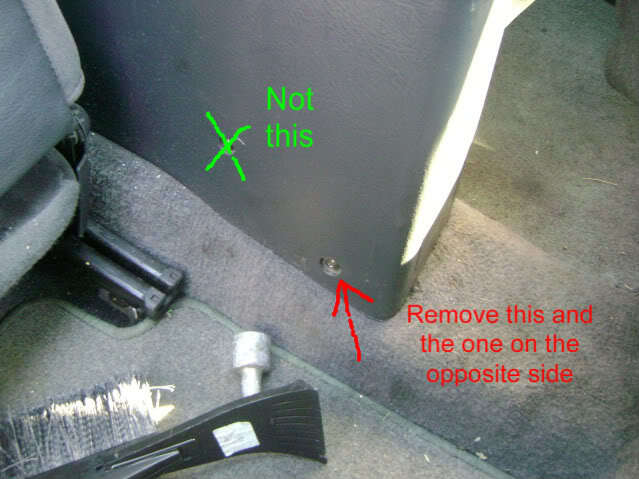 Remove the two screws (one on each side) in the back of the center console. Life the back end of the center console up and take it off. This is what you should be looking at. Drop E-brake. Take a 12mm wrench and tighten the nut on the end, something like 1-2 complete turns. Pull up on the E-brake (about 5-6 clicks), and try to spin the rear wheels by hand, if the wheels move/spin, go back in and tighten the E-brake 1/2-1 turn more, then proceed to check the rear wheel again. Once the E-brake is up a few clicks, and the rear wheel doesn't move at all when spun, go back in the car, drop the E-brake down, and then spin the wheels again. If they spin freely, you're done. If they quickly stop, or show signs of something dragging on it, go into the car and loosen the nut 1/4-1/2 turn, pull the E-brake up 5-6 clicks (making sure it still stops the rear wheels from spinning), if everything is still good, drop the E-brake, and spin the tires again. Repeat until the wheels spin freely when the E-brake is down, and will not move when the E-brake is up 5-6 clicks. You are done. Putting everything back together is the reverse of removal. Now, park that bad boy on the steepest hill in town (make sure the car is in gear, too), and walk away with confidence. Last edited by WellFedHobo; 02-25-2010 at 01:16 PM. nice write up but put in there if you have rear drums, jack it up, take the wheel off, take the drum cover off, and adj the rear pads a little at a time each time put the drum cover back on, you want the pads to barely touch the drum, when you spin the drum it should have a slight tension on it. 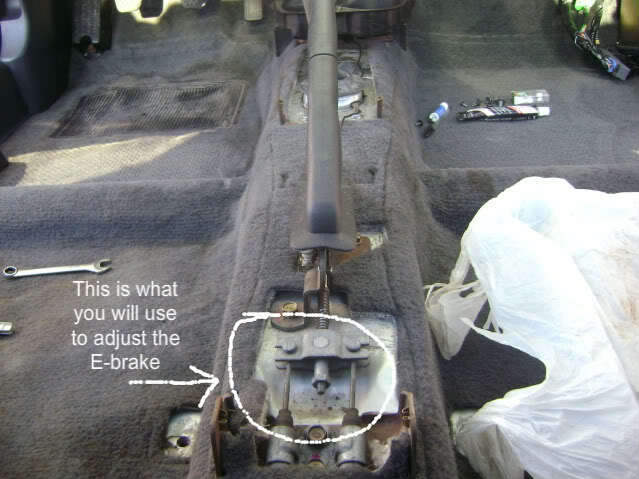 For just the ebrake adjustment, you don't have to remove the front part. Just the arm rest. But otherwise, good writeup. ^^ Edited. Thanks for the clarification on that Hobo!